Our latest CD and vinyl release! For sale now! 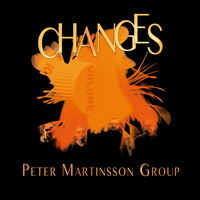 Peter Martinsson Group's album "Changes". The CD has 12 songs and the vinyl 8 songs. It's a Journey, Never Again, Changes, You Can Dance, Ahead of Time, Happy Happie, Wildfire, You won't Break my Heart, Ping Pong Song, Loosen Up, Barkbrödlåten, How Great Thou Art. The last four songs are on the CD only. Why do not buy the box and get the CD, the vinyl LP and a super nice T-shirt of your size? No Postal fees within Sweden but we need to add 99:- extra for deliveries outside Sweden. No payment right now - We create an invoice with payment instructions when products are prepared and availble for delivery. We use Paypal and Swish along with payment directly to our bank acoount.